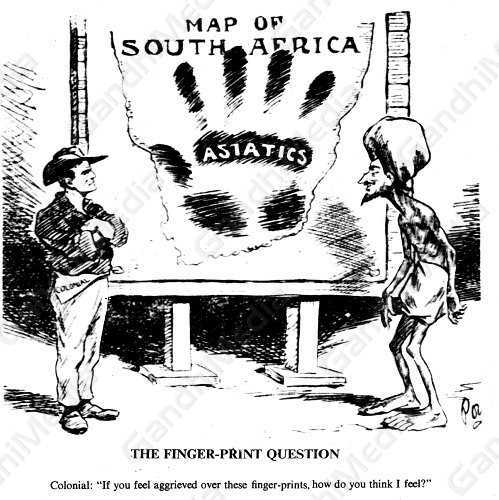 The Finger-Print Question - Colonial: “If you feel aggrieved over the finger-prints, how do you think I feel?” – 1907. The Registration Act enforced in the Transvaal in 1907 compelled people of Asian origin to take out certificates of registration which bore their thumb prints. Gandhi welcomed the Act as a challenge and founded the Passive Resistance Association to combat it. He said: "We must congratulate the Transvaal Government for the courage of their convictions. If we are conscious of the work of slavery the Act will put on us, we will meet it and refuse to submit to it. The brave rulers, who know the value of action rather than of any speech, can only respond to bravery and practical action." The colonials' exaggerated fear that Asiatics would overrun South Africa is depicted in the cartoon.